Obesity rates have increased in the USA over the years, but the steep increase starting around the 1980s is unusual. Wang and Beydoun do a good job at discussing this puzzling phenomenon (), and a blog post by Discover Magazine provides a graph (see below) that clear illustrates it (). You may be tempted to point at increases in calorie intake and/or changes in macronutrient composition, but neither can explain this sharp increase in obesity in the 1980s. The differences in calorie intake and macronutrient composition are simply not large enough to fully account for such a steep increase. And the data is actually full of oddities. For example, an article by Austin and colleagues (which ironically blames calorie consumption for the obesity epidemic) suggests that obese men in a NHANES (2005–2006) sample consumed only 2.2 percent more calories per day on average than normal weight men in a NHANES I (1971–1975) sample (). 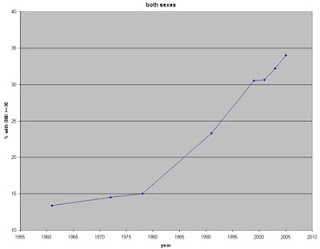 So, what could be the main reason for the steep increase in obesity prevalence since the 1980s? This age-obesity connection also reflects an interesting difference between humans living “in the wild” and those who do not, which becomes more striking when we compare hunter-gatherers with modern urbanites. Adult hunter-gatherers, unlike modern urbanites, do not gain weight as they age; they actually lose weight (, ). Modern urbanites gain a significant amount of weight, usually as body fat, particularly after age 40. The table below, from an article by Flegal and colleagues, illustrates this pattern quite clearly (). Obesity prevalence tends to be highest between ages 40-59 in men; and this has been happening since the 1960s, with the exception of the most recent period listed (1999-2000). In the 1999-2000 period obesity prevalence in men peaked in the 60-74 age range. Why? With progress in medicine, it is likely that more obese people in that age range survived (however miserably) in the 1999-2000 period. Obesity prevalence overall tends to be highest between ages 40-74 in women, which is a wider range than in men. Keep in mind that women tend to also live longer than men. Because age seems to be associated with obesity prevalence among urbanites, it would be reasonable to look for a factor that significantly increased survival rates as one of the main reasons for the steep increase in the prevalence of obesity in the USA in the 1980s. If significantly more people were surviving beyond age 40 in the 1980s and beyond, this would help explain the steep increase in obesity prevalence. People don’t die immediately after they become obese; obesity is a “disease” that first and foremost impairs quality of life for many years before it kills. Now look at the graph below, from an article by Armstrong and colleagues (). 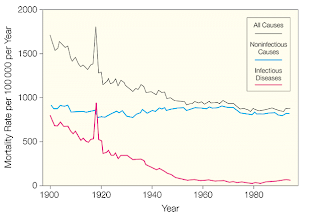 It shows a significant decrease in mortality from infectious diseases in the USA since 1900, reaching a minimum point between 1950 and 1960 (possibly 1955), and remaining low afterwards. (The spike in 1918 is due to the influenza pandemic.) 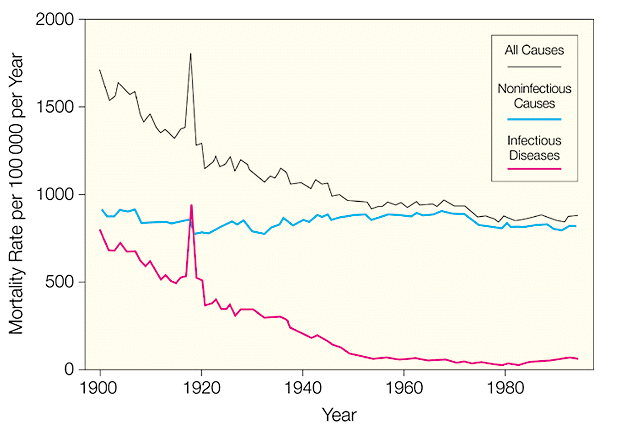 At the same time, mortality from non-infectious diseases remains relatively stable over the same period, leading to a similar decrease in overall mortality. When proper treatment options are not available, infectious diseases kill disproportionately at ages 15 and under (). Someone who was 15 years old in the USA in 1955 would have been 40 years old in 1980, if he or she survived. Had this person been obese, this would have been just in time to contribute to the steep increase in obesity trends in the USA. This increase would be cumulative; if this person were to live to the age of 70, he or she would be contributing to the obesity statistics up to 2010. Americans are clearly eating more, particularly highly palatable industrialized foods whose calorie-to-nutrient ratio is high. Americans are also less physically active. But one of the fundamental reasons for the sharp increase in obesity rates in the USA since the early 1980s is that Americans have been surviving beyond age 40 in significantly greater numbers. This is due to the success of modern medicine and public health initiatives in dealing with infectious diseases. PS: It is important to point out that this post is not about the increase in American obesity in general over the years, but rather about the sharp increase in obesity since the early 1980s. A few alternative hypotheses have been proposed in the comments section, of which one seems to have been favored by various readers: a significant increase in consumption of linoleic acid (not to be confused with linolenic acid) since the early 1980s. The vertical auto profile (VAP) test is an enhanced lipid profile test. It has been proposed, chiefly by the company Atherotech (), as a more complete test that relies on direct measurement of previously calculated lipid measures. The VAP test is particularly known for providing direct measurements of LDL cholesterol, instead of calculating them through equations (). At the time of this writing, a typical VAP test report would provide direct measures of the cholesterol content of LDL, Lp(a), IDL, HDL, and VLDL particles. It would also provide additional measures referred to as secondary risk factors, notably particle density patterns and apolipoprotein concentrations. Finally, it would provide a customized risk summary and some basic recommendations for treatment. Below is the top part of a typical VAP test report (from Atherotech), showing measures of the cholesterol content of various particles. LDL cholesterol is combined for four particle subtypes, the small-dense subtypes 4 and 3, and the large-buoyant subtypes 2 and 1. A breakdown by LDL particle subtype is provided later in the VAP report. In the table above, HDL cholesterol is categorized in two subtypes, the small-dense subtype 2, and the large-buoyant subtype 3. Interestingly, most of the HDL cholesterol in the table is supposedly of the least protective subtype, which seems to be a common finding in the general population. VLDL cholesterol is categorized in a similar way. IDL stands for intermediate-density lipoprotein; this is essentially a VLDL particle that has given off some of its content, particularly its triglyceride (or fat) cargo, but still remains in circulation. Lp(a) is a special subtype of the LDL particle that is purported to be associated with markedly atherogenic factors. Mainstream medicine generally considers Lp(a) particles themselves to be atherogenic, which is highly debatable. Among other things, cardiovascular disease (CVD) risk and Lp(a) concentration follow a J-curve pattern, and Lp(a)’s range of variation in humans is very large. A blog post by Peter (Hyperlipid) has a figure right at the top that illustrates the former J-curve assertion (). The latter fact, related to range of variation, generally leads to a rather wide normal distribution of Lp(a) concentrations in most populations; meaning that a large number of individuals tend to fall outside Lp(a)’s optimal range and still have a low risk of developing CVD. Below is the middle part of a typical VAP report, showing secondary risk factors, such as particle density patterns and apolipoprotein concentrations. LDL particle pattern A is considered to be the most protective, supposedly because large-buoyant LDL particles are less likely to penetrate the endothelial gaps, which are about 25 nm in diameter. Apolipoproteins are proteins that bind to fats for their transport in lipoproteins, to be used by various tissues for energy; free fatty acids also need to bind to proteins, notably albumin, to be transported to tissues for use as energy. Redundant particles and processes are everywhere in the human body! Below is the bottom part of a typical VAP report, providing a risk summary and some basic recommendations. One of the recommendations is “to lower” the LDL target from 130mg/dL to 100mg/dL due to the presence of the checked emerging risk factors on the right, under “Considerations”. What that usually means in practice is a recommendation to take drugs, especially statins, to reduce LDL cholesterol levels. A recent post here and the discussion under it suggest that this would be a highly questionable recommendation in the vast majority of cases (). What do I think about VAP tests? I think that they are useful in that they provide a lot more information about one’s lipids than standard lipid profiles, and more information is better than less. On the other hand, I think that people should be very careful about what they do with that information. There are even more direct tests that I would recommend before a decision to take drugs is made (, ), if that decision is ever made at all.